Ever wondered how the more basic needs of a late antique city were met? Then read on, as Dr Luke Lavan takes us on a journey through the urban sewer systems of the period. Some years ago a senior scholar suggested that Late Antiquity was a period in which drains were not decent, as they had been in the high imperial period. The later drains of Italy and Africa were often just left blocked up. He suggested that one of causes of a decline in standards was the rise of Christianity, which promoted an other-worldly indifference to dirt, most notably seen in the unkempt appearance of monks, and in suspicion towards public bathing. According to this theory, too much religion makes you stink. Well, if there is any truth in this, it is decidedly a western impression, and is nothing to with religion. In the Christian East Mediterranean, the construction and maintenance of drains and sewers continued apace, up to the end of the 6th century. Sewer systems built in Caesarea Palestinae, Carthage or Justiniana Prima, were as fine as any seen in earlier times, often taking in surface water off the road, as well as collecting the doings and industrial wastes of houses and shops along their path. Very often they were laid in a unit, with the fresh water supply lying immediately on top, in separate ceramic pipes or mortar-lined channels. Man holes were provided to permit access to the sewers and repairs were frequent. 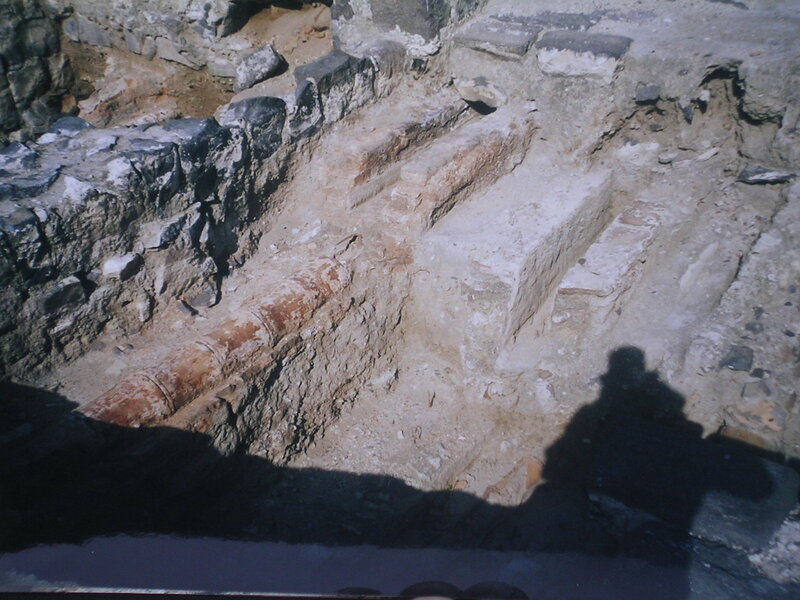 Photo showing the system below a 6th c. street at Scythopolis. In this case, the terracotta pipe on the bottom would have carried waste water whilst the channel above would have probably contained fresh water. An earlier system is visible on the right [Photo: Dr Luke Lavan]. The most elaborate sewers were undoubtedly those of Constantinople. Here the contents of a silver chamber pot from a great house might be emptied into a kitchen(!) toilet, along with cooking waste. It could then be flushed away with some cabbage water, helped along by a hot discharge from a nearby baths. After flowing through a round terracotta pipe, our undesirable substance would have soon found itself floating through a barrel-vaulted road sewer, just big enough to crawl through, joined on right or left by regular blasts coming from road or house drains. ‘…in the sewers where there is accumulation of refuse, of dung, hay, stubble, stones, clay, frequent stoppages occur; and then the stream of filth overflows at the top.’ (Joh. Chyrs. Hom in 2 Cor. 12.6 (PG 61.490)). The Mese’s twin sewers ran very straight down to the city centre, and must have taken on an enormous quantity of water. Outside Hagia Sophia they joined an even bigger sewer, which was some 2.2m wide and probably 3.75m deep – large enough to ride a cart down. 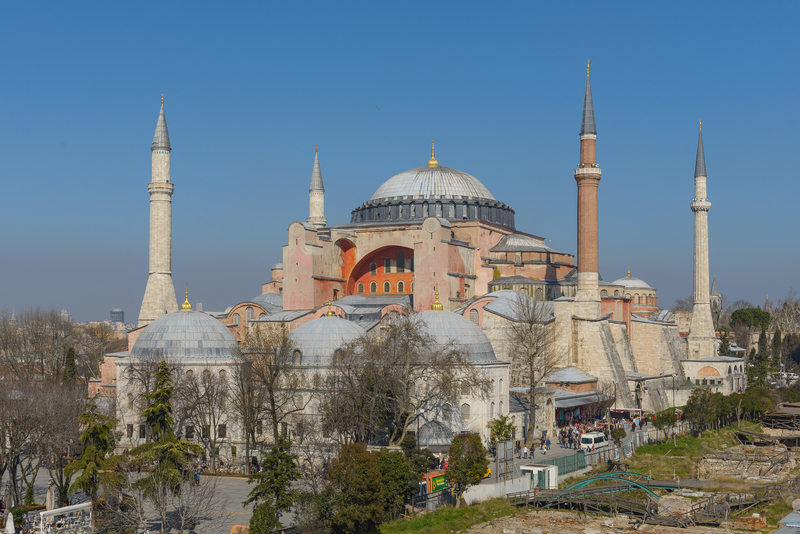 Hagia Sophia, Istanbul [Image source]. Soon, it all ended up in the sea, as no dirty-water filtering system existed. The outflow was likely not a pleasant sight. It inspired Procopius (Anecdota 19.3) to produce a memorable metaphor for the financial policy of Justinian: after the emperor had drunk the Bosphorus dry, the sewers of Byzantium were still able to provide him with a diet of rubbish and filth. What an unpleasant sight must have greeted maritime visitors to the city, viewing its gilded shores … not only boats floated on the Golden Horn. Yet the city itself was clean.